In order to participate, pick up a reading log from the CCC, log or attempt to log around 100 hours or reading from now until the end of the summer, and then attend a free pizza party (TBA). You can read whatever you want, though extra hours will be awarded for reading suggested readings and completing accompanying quizzes. Most of these books can be found in this distro and the rest should be available from the public library. “Nanni Balestrini was born in Milan in 1935. Known both as an experimental writer of prose and verse and as a cultural and political activist, he played a leading role in avant-garde writing and publishing in the sixties. His involvement with the extra-parliamentary left in the seventies resulted in terrorism charges (of which he was subsequently acquitted) and a long period of self- imposed exile from Italy. Let A Thousand Hands… is an extract translated from the novel La Violenza Illustrata (Einaudi, 1976). Using one of Balestrini’s favorite techniques, it is a montage of newspaper reports of the death of Mara Cagol, one of the founders of the Red Brigades. FIAT (1977) is a first-hand account of work (or its refusal) at the infamous FIAT plant in Turin, Italy. “Everyone knows the terrible communities, having spent time in them or being within them still because they are always stronger than the others. And because of that one always stays, in part – and parts at the same time. Family, school, work, and prison are the classic faces of this form of contemporary hell. But they are less interesting as they belong to an old form of market evolution and only presently survive. On the contrary, there are the terrible communities which struggle against the existing state of things that are at one and the same time attractive and better than “this world.” And at the same time their way of being closer to the truth – and therefore to joy – moves them away from freedom more than anything else. “OLYMPIA – An apparent anti-police arsonist entered the new City Hall, used some kind of chemical accelerant and set fire to a stack of construction materials, causing an undetermined amount of damage and setting back a $35.6 million project that had been on schedule. Firefighters were called to the four-story building under construction in the 600 block of Fourth Avenue East at 5:34 a.m. Thursday. They put the fire out within minutes, but the damage was done. The fire, though confined to one room, spread smoke through the building, blackening new drywall. It also melted wiring on the first and second floors. It’s unclear when the fire was started, but it was after workers had quit for the day on Wednesday. The fire was set in what will become the police department’s squad room, said Rick Dougherty, project manager for the new City Hall. “(Expletive) PIGS” was spraypainted in red on one of the walls outside the room where the fire started. No one at the scene was injured. Police were investigating the fire as suspicious. Construction workers arriving on the job Thursday morning discovered the blaze and called 911. The Olympia Fire Department was dispatched at 5:34 a.m. and arrived at 5:37 a.m. The fire was reported out at 5:49 a.m.
An estimate of the damage probably won’t be ready until today, Dougherty said. Investigators were expected to be on the site Thursday from insurance companies for both the city and the contractor, Hoffman Construction. Dougherty said he didn’t want to speculate about how long the fire would set the project back. No work was done on the site while fire and police departments investigated. City employees were expected to move into the new City Hall at the beginning of next year. Dougherty said it was the second attempt in two days to set a part of the site ablaze. On Wednesday, a Hoffman employee discovered that someone had tried to set fire to a construction trailer where the company has makeshift offices. The small fire singed the corner of the trailer but did no significant damage. Cmdr. Tor Bjornstad said police had been made aware of that fire, and had stepped up patrols Wednesday night in the area. He said police would remain on alert. Private security and surveillance cameras may be brought in, he said. Such anti-police sentiments are not uncommon among vandals. “We get a lot of anti-police graffiti,” Bjornstad said. Dougherty said that there have been minor incidents of vandalism at the site before — some construction signs tagged or stolen. But nothing serious. “It’s a rough neighborhood,” he said. The new City Hall is being built there, in part, to change that, he said. The fire won’t affect plans for street improvements around the building, Dougherty said. The right-turn-only lane on Fourth Avenue to Plum Street will remain closed from Jefferson Street to just past the Chestnut Street intersection. Parking on the south side of Fourth Avenue between Jefferson Street and Plum Street will be restricted. By Thursday afternoon, police still had no suspects, Bjornstad said. 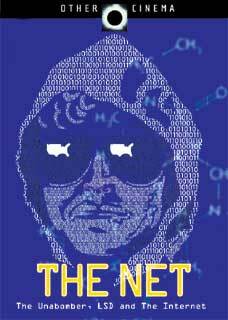 “Ultimately stunning in its revelations, Lutz Dammbeck’s THE NET explores the incredibly complex back-story of Ted Kaczynski, the infamous Unabomber. This exquisitely crafted inquiry into the rationale of this mythic figure situates him within a late 20th Century web of technology – a system that he grew to oppose. A marvelously subversive approach to the history of the Internet, this insightful documentary combines speculative travelogue and investigative journalism to trace contrasting counter cultural responses to the cybernetic revolution.